Nutrience gives you the choice of multiple levels of nutrition for your cat, from Original right up to Subzero. Browse by range or by lifestage below. Grain Free: A simple, wholesome ingredients list with no gluten, wheat, corn or rice. Fresh, never frozen meat. A complete, ancestral-based diet with multiple protein sources for variety. Available in Kitten for growth, or for multi-cat households choose Cat formulated both for growth & adult cats. Subzero Grain Free: Everything Grain Free offers, plus the added nutritional benefits of raw in an easy-feed kibble recipe. Fresh, never frozen meat, plus NutriBoost: delicious, nutritious chunks of freeze-dried raw chicken. A complete & balanced, protein-rich, ancestral-based diet with multiple protein sources for variety. Available in Cat for growth & adult cats. TIP: If your adult cat is pregnant or lactating, feed Nutrience Kitten Grain Free or Subzero starting from the 3rd to 4th week of gestation. Continue until her kittens are weaned. Original > The original Nutrience recipe. An affordable premium formula that's budget-friendly, without compromise on quality. Simple, wholesome ingredients. No by-products, no fillers, no artificial colours, flavours or preservatives. Grain Free > Original without the grains, plus more fresh, never frozen meat & the natural added goodness from nutrient-rich botanicals, vegetables & superfoods. An ancestral-based diet with multiple protein sources. Grain free: no gluten, wheat, rice or corn. Subzero Grain Free > Welcome to the top. Everything Original & Grain free offer, with the added benefits of raw in an easy-feed kibble recipe. Fresh, never frozen meat, plus NutriBoost: delicious, nutritious chunks of freeze-dried raw meat. A taste even the fussiest cat will love, in a complete, ancestral-based diet. A quarter century ago, Nutrience set out to make an uncomplicated pet food that included nothing but simple, wholesome ingredients. Not much has changed since that time, and we’re proud of that fact. 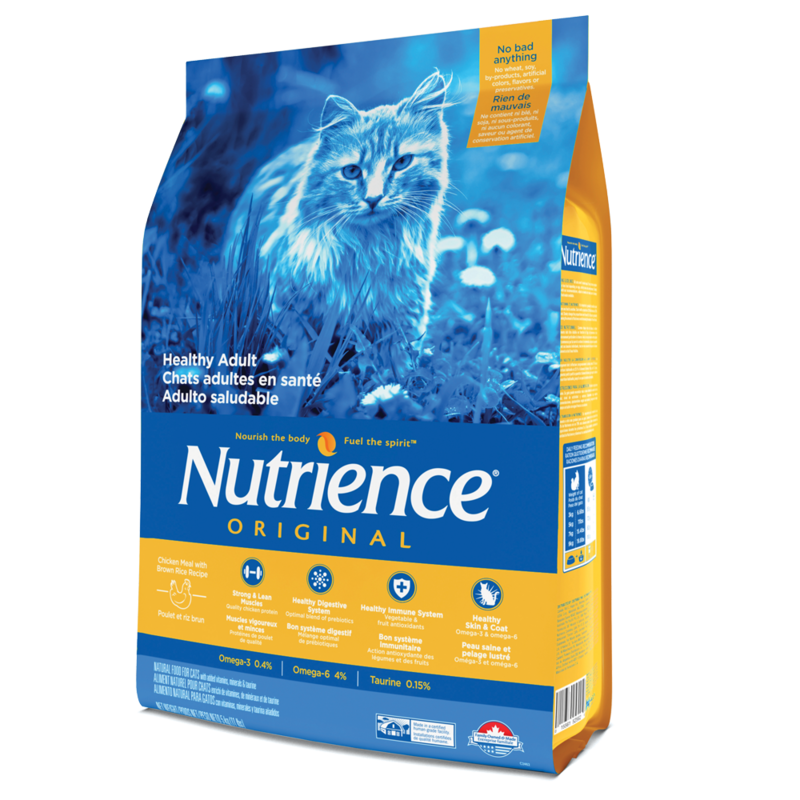 Nutrience Original gives cat owners great nutrition at an affordable price. The perfect upgrade to premium from supermarket-quality cat food. A popular budget friendly choice for multi cat households. We encourage pet owners to compare the ingredients & value of Nutrience Original to the food you feed now. The next level up. Nutrience Grain Free more closely mimic's a carnivore's ancestral diet. 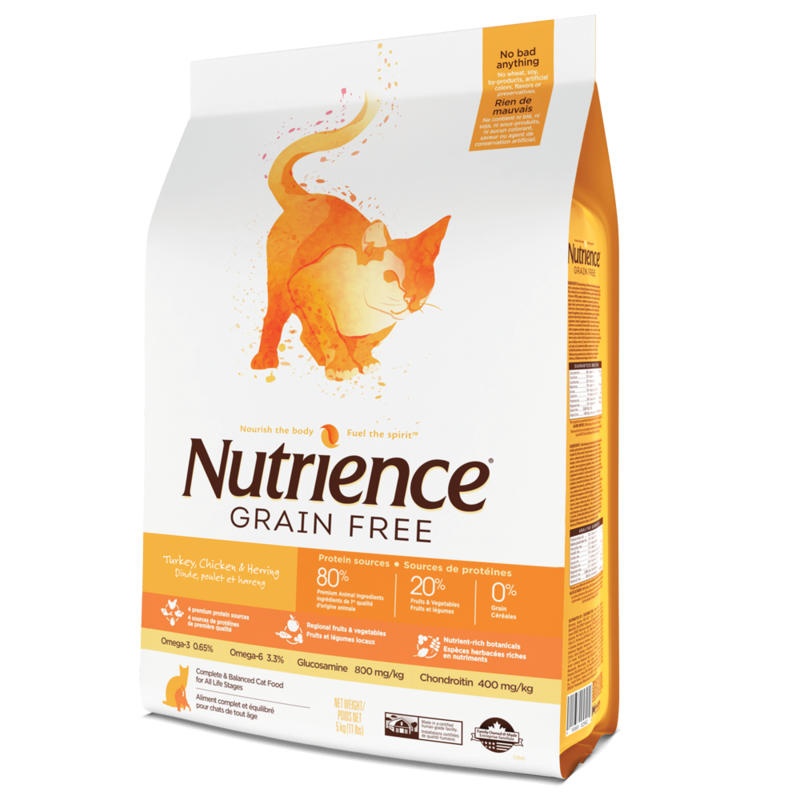 Starting from the same principle as Nutrience Original with simple, wholesome ingredients, Grain Free includes fresh, never frozen meat & fish & removes the grains for cats sensitive to gluten, wheat, corn or rice - or for owners who simply wish to feed their pets a grain-free diet. No by-products, no artificial flavours, colours or preservatives, no grains... just great nutrition in every meal. Available in: Ocean Fish Cat for all ages, including kittens | Turkey Chicken & Herring in Kitten for growth or Cat for all ages | Turkey Chicken & Duck for cats with hairballs - also formulated for cats who spend a lot of time indoors, or for cats who are less active / overweight. 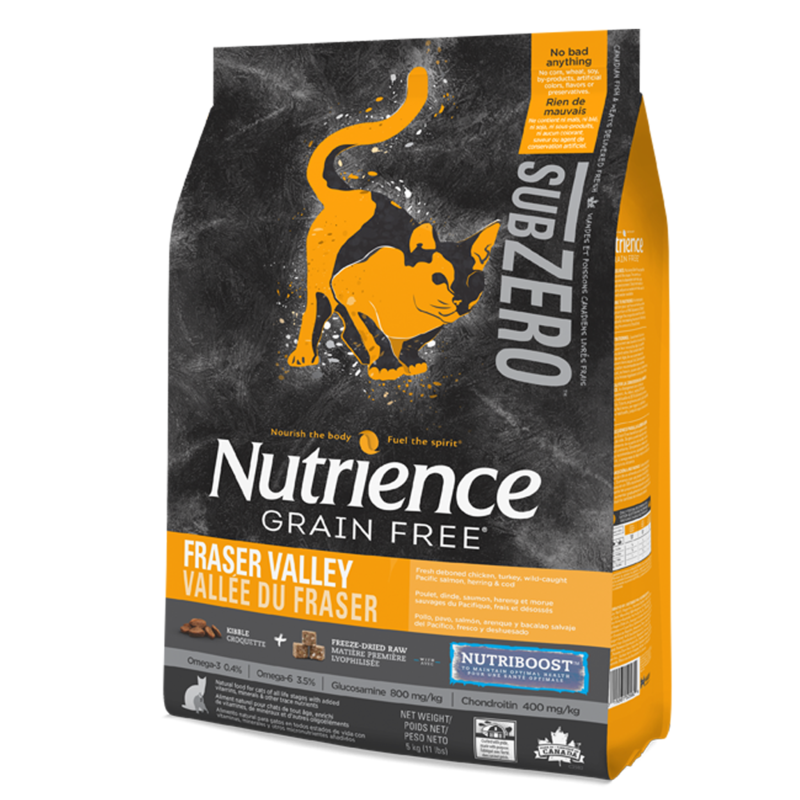 Nutrience Subzero Grain Free is an ancestral diet combining protein-rich kibble & freeze-dried raw NutriBoost chunks to deliver the nutritional benefits of raw in a convenient & easy to feed kibble recipe. Subzero is an all lifestage formula, for kittens & adults. Prepared with fresh, never frozen locally-caught & sourced meat, including cage-free deboned chicken & turkey, salmon, herring & cod wild-caught from the Pacific & real freeze-dried raw chicken for a superior flavor that even the fussiest eater will love, guaranteed. Subzero Grain Free > Welcome to the top. Everything Original & Grain free offer, with the added nutritional benefits of raw in an easy-feed kibble recipe. Fresh, never frozen meat, plus NutriBoost: delicious, nutritious chunks of freeze-dried raw meat. A taste even the fussiest cat will love, in a complete, ancestral-based diet.